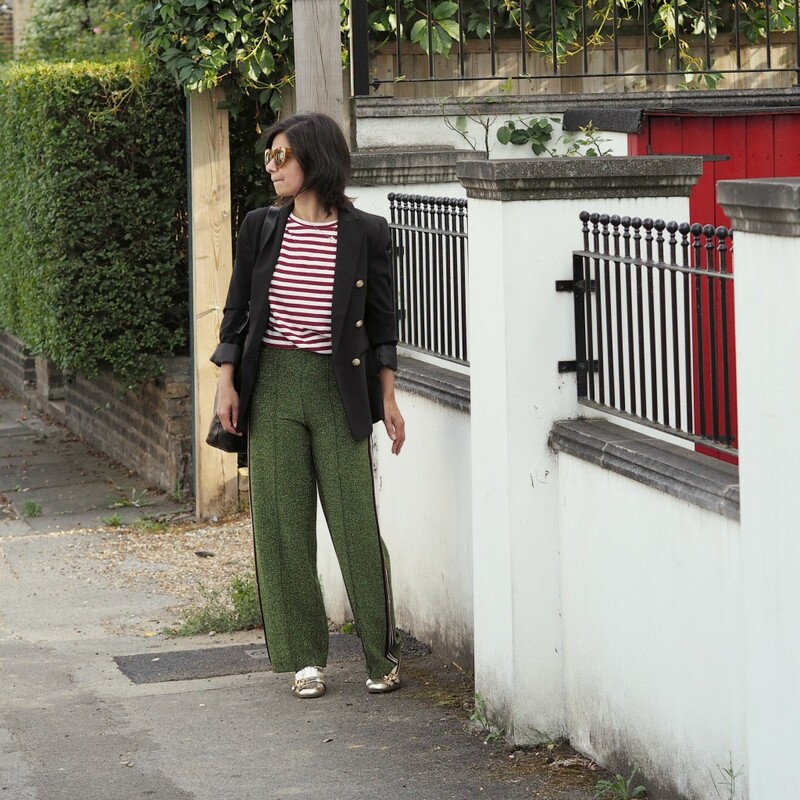 So… as promised on Sunday here’s a little review post about those HM Glittery Green Trousers (£39.99 – currently sold out, though they may get re-stocked). I mentioned on Sunday that I’d try and recreate these Looks, but alas, with builders arriving here for our renovations there have been bedrooms and bathrooms to clear out and dump runs to do and furniture to dismantle and amidst all that ‘glamour’… there just hasn’t been any time to play dress-up and pap myself. Sorry! I’m pleased to report that I have managed to take the trousers up – both legs! I ended up hand-stitching the hem which was easier than getting the sewing machine out; also, the lurex hides my terrible stitching as well! I’d been in London most of the afternoon and popped into a couple of department store press days (again, more on what I thought of my first ever PR events next week) … but it was a muggy afternoon and I wore my Red Herring Dress with a tee under it which was actually a good outfit for the weather… but I knew I’d be doing a lot of walking and would get hot and sweaty by the evening. So, not wanting to turn up ‘stinking’ to Sunita’s event at Neptune, I took a spare outfit: the glittery green trousers, of course. Now, I managed to set my tripod and camera up to pap myself on a random street in Wimbledon but was having tech-issues with my phone refusing to connect to the camera… I got hot and bothered and packed up when I spotted a random, humble looking chap whom I accosted to take my pic. I felt like the striped tee made the look more casual with the wine stripe tying in with the side stripe of the trousers; and rather than my very yellow gold Karter Topshop Loafers, the Gucci’s are a paler, more subtle platinum gold. I had struggled with what ‘outerwear’ to go for, but in the end, I went for this oversized New Look Blazer… mainly because of the gold buttons! The day’s humidity had caught up with my hair by the early evening, as you may well be able to tell. 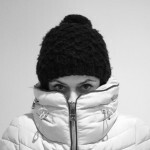 Joanne is Fran’s (@thefashion_lift’s) sister and I’ve a feeling she may be used to taking outfit pics – thank you!! From the photo on the left, you’ll notice that the fabric of the trousers is very unforgiving… lurex trousers are *not* going to be everyone’s cup of tea, and indeed they highlight any VPL, bony hips, tummies… although the trousers (which fasten via a zip at the back) are super high waisted so they also sort of hold your tummy in. I do plan on trying out those those Looks I talked about the other week, and have a feeling that trainers and a bright pink sweatshirt with the trousers might become one of my favourite Autumn looks. And that’s it this week… short and sweet you say? I am not a sheep: I will never buy anything just because everyone else is wearing it. And what I mean by that is, I don’t buy items just because they are “the thing” to be seen in. However, I will buy clothing I like, which I may have spotted all of my own accord, or perhaps on others; things that grab my attention are clothing which I think will suit me and work for me in my wardrobe. Whether I’ve seen the item in a magazine, or on someone walking down the street, or indeed on Instagram… we are all inspired by others, whether innately or obviously. 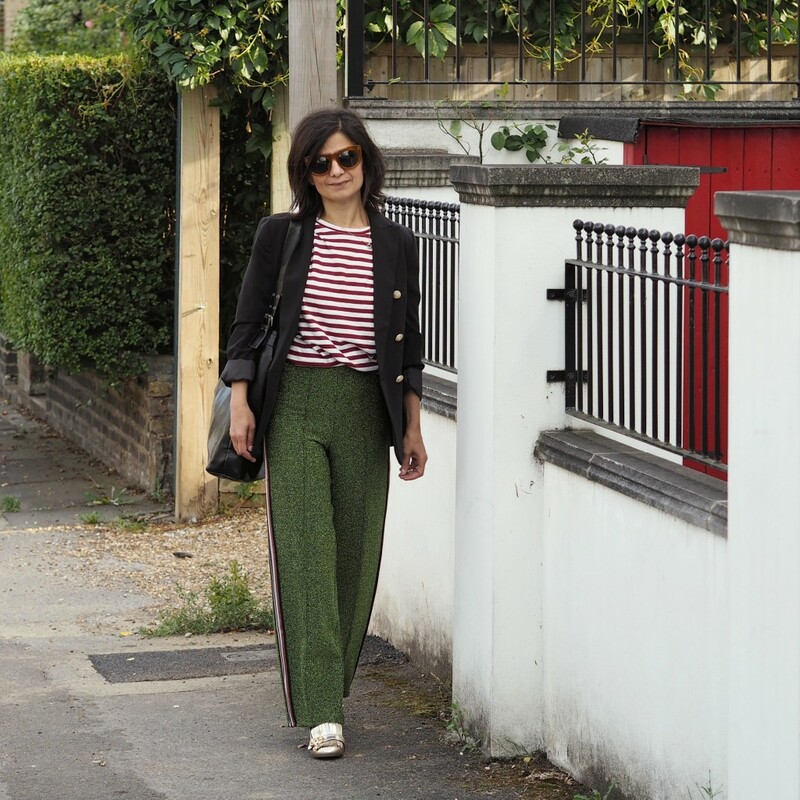 In the case of these Green trousers, I saw them on someone who was featured on an Instagram Stories Video by Alex (@thefrugality) of an event she was at. I then spent the next 20 odd hours hitting refresh on the ‘new-in’ section of HM until the trousers finally appeared that evening and I purchased them. I have since found out that it was Jasmine Hemsley (@hemsleyhemsley) featured on Alex’s Stories. I’m not sure I should admit to this but… it’s someone I’d not heard of and someone I don’t follow. 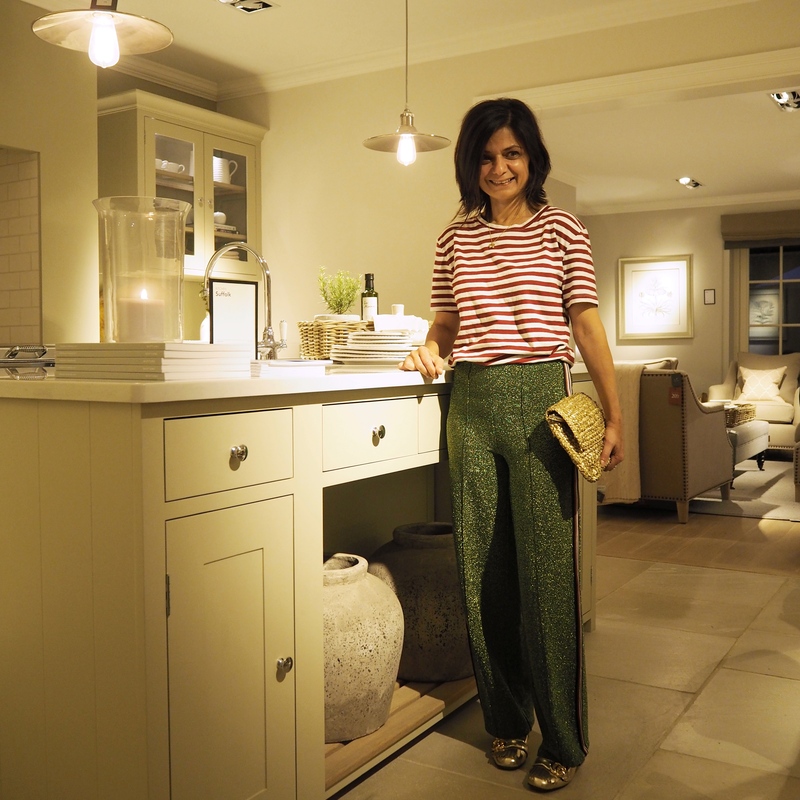 But either way – she looked TOTALLY fabulous in her trousers which were sparkly, olive green with a side stripe… 3 things I love, and that’s where my desire to purchase the trousers came from. And given the trews are now sold out – perhaps a great many of us saw that same Instagram Story or perhaps there are simply a great many of us magpies out there. Either way, I have noticed that on Instagram, people say you should be you, which is true, but with more and more of the “don’t copy, don’t be a sheep – be yourself, be different…” remarks popping up on my feed, I wanted to say – being ‘different’ is what I tried to do when I was a teen… and at 46, I’m pretty happy with who I am and my style, which is always a work in progress because over time, we all change and evolve… it’s difficult to be unique and different when you are at the mercy of the high street which is the high street… and it’s where I shop from in the main… much as I’d love to shop entirely from independent boutiques, I can’t afford their prices for day to day… however un-unique my high street pieces may be, there is one thing unique about them: me… my styling, my own vibe. And I’m happy with that. And… in case you are wondering… no, I haven’t been trolled… it’s just something I wanted to get off my chest. Okay… ranting and soapbox-ing done with… spill: what do you think of the trews? Leave a comment below – I’d love to hear from you!